I’ve been asked to sit in on a panel discussion next Monday, Jan. 31, at the studios of WFPL, Louisville’s NPR News station. I’ll be on State of Affairs, the locally produced public affairs show hosted by Julie Kredens, live at 1 p.m. The show will be rebroadcast that evening at 9 p.m. and then will be available afterward, online, for your private listening by download. Laura Ellis, the acting producer of the show, has asked me to be prepared to discuss the topic in the title of this post: Books That Changed Our Lives. I’m able to answer that question fairly quickly, and I may or may not preview for you the three-and-a-half books I chose to discuss. In the meantime, let me invite you to share with me your own books that changed your lives. Use the comments section below, if you will. I have to admit that one of the reasons I read is that most books change my life. They allow me to travel. They allow me to experience environments and people I would be unlikely to otherwise encounter. It may just be that those among us who do not enjoy reading refrain from doing so primarily because reading books does nothing to change their lives. I will admit that my selected books and the stories behind them are not profound or dramatic. While my life has been filled with interesting stories, the changes wrought, by books or by other experiences, have not been the stuff of gripping memoir or biography. Admittedly, when I was very young, I fully expected that my life would be one that provided dramatic turning points, cinematic moments, and widespread fame. And these books would have been just as important to that imagined life as they have been to the life I’ve lived so far, to middle age. So please don’t be reticent about sharing your own book or books that changed your life. I think one thing we all share is a keen appreciation of just how life-changing reading can be. Join us Saturday, Jan. 29, at 4 p.m. as we welcome Gary Yeagle and Marlene Mitchell, local authors who have collaborated on a new book series, The Smoky Mountain Murders. Their new novel, Seasons of Death, is published by our friend Dave Mattingly at Blackwyrm Publishing, and it’s already drawing great interest within our patron base. 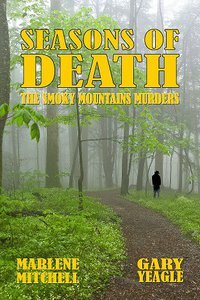 So many of us feel as if we know the Great Smoky Mountains National Park (I practically grew up there) that the idea of a murder mystery set there seems perfectly natural. In partnership with another NewAlbanyFirst pioneer, we’ll be offering a pick-your-own discount on the day of the event. If you dine at Bank Street Brewhouse on Saturday before the author event, bring your receipt to the signing and we’ll give you $2 off the $15.95 price of the book. If you prefer, come to the event and then join the authors for libations and/or dinner at Bank Street Brewhouse, 415 Bank St., New Albany. Chef Josh has promised a discount on that establishment’s amazing pommes frites, frenched potatoes double-fried in the Flemish style, accompanied by some of the most mouth-watering dipping sauces you’ve ever imagined. BSB is a non-smoking restaurant/brasserie, and the whole gang there is looking forward to hosting the authors and their friends starting around 5:30 p.m. Of course, the region’s finest craft beers, local wines, and independently produced spirits are available, also. If you follow the @NewAlbanyBooks Twitter feed, you can find out that day’s specials on Saturday, too. I look forward to hearing you on WFPL. So glad you are partnering with BSB, a great combination. Just before I read Tom Wolfe’s “The Right Stuff,” I was on the verge of washing out of college. Just didn’t think I was measuring up to expectations–and wasn’t sure what had become of my own. But then I read about the thrilling adventures of the early days of the American space program–how haphazard it could be, how absurd things could get, and how there was room for many kinds of personalities to become part of it all–with the entire tragicomedy wrapped in Wolfe’s substantial yet offhandedly light style of prose. I re-embraced the pursuit of science with a more mature vigor that was lightened with humor, and that has served me ever since.